Hildebrand Mennonite Church, Waynesboro, Virginia, 2009. Hildebrand Mennonite Church (MC), located in Augusta County, Virginia, 1/2 mile (one kilometer) west of Madrid and six miles (9.6 kilometers) north of Waynesboro, took its name from the Hildebrand family who were large landowners in that vicinity and leaders in the church—Jacob Hildebrand serving as minister and bishop for a number of years. Jacob R. Hildebrand was a preacher. 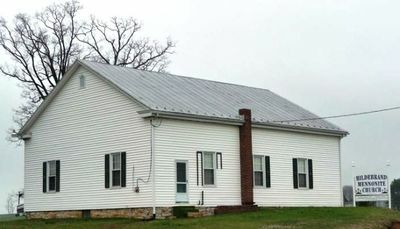 The church, likely the first Mennonite church in the Southern (Augusta County) District of the Virginia Conference, was a small log meetinghouse, probably built in 1826 when the land was deeded. A larger frame church was built across the road from the first in 1876. It is thought that this was the first church in Virginia to be formally dedicated. In 1955 the church had a membership of 56, with Joseph H. Weaver of Waynesboro as pastor. In early 2003 the congregation, by this time an independent Mennonite church, moved to 2506 Barter Brook Road in Staunton, Virginia, and took the name Olive Branch Christian Church (Hildebrand Mennonite Church). In 2008 it had 25 members. The Hildebrand Mennonite church building was purchased in 2006 and donated to the Valley Brethren-Mennonite Heritage Center by Addison Boehnert with a vision for it to be preserved and available for rental by families and church or community groups. Brunk, Harry A. and Sam Steiner. "Hildebrand Mennonite Church (Augusta County, Virginia, USA)." Global Anabaptist Mennonite Encyclopedia Online. October 2008. Web. 19 Apr 2019. http://gameo.org/index.php?title=Hildebrand_Mennonite_Church_(Augusta_County,_Virginia,_USA)&oldid=117432. Brunk, Harry A. and Sam Steiner. (October 2008). Hildebrand Mennonite Church (Augusta County, Virginia, USA). Global Anabaptist Mennonite Encyclopedia Online. Retrieved 19 April 2019, from http://gameo.org/index.php?title=Hildebrand_Mennonite_Church_(Augusta_County,_Virginia,_USA)&oldid=117432. Adapted by permission of Herald Press, Harrisonburg, Virginia, from Mennonite Encyclopedia, Vol. 2, p. 741. All rights reserved. This page was last modified on 6 April 2014, at 07:10.